Powerful ceramic column heater for fast, allergy-friendly warming of cold rooms. Two heating stages with 1200 and 2200 W, oscillation function as well as degree-adjustable temperature from 10 to 49 ° C.
Extremely stable, long-lasting, low noise and suitable for allergic persons thanks to a ceramic heating element. The Hightower Heat ceramic fan heater from Klarstein bring the advantages of ceramic heating elements in a classic look into every apartment. 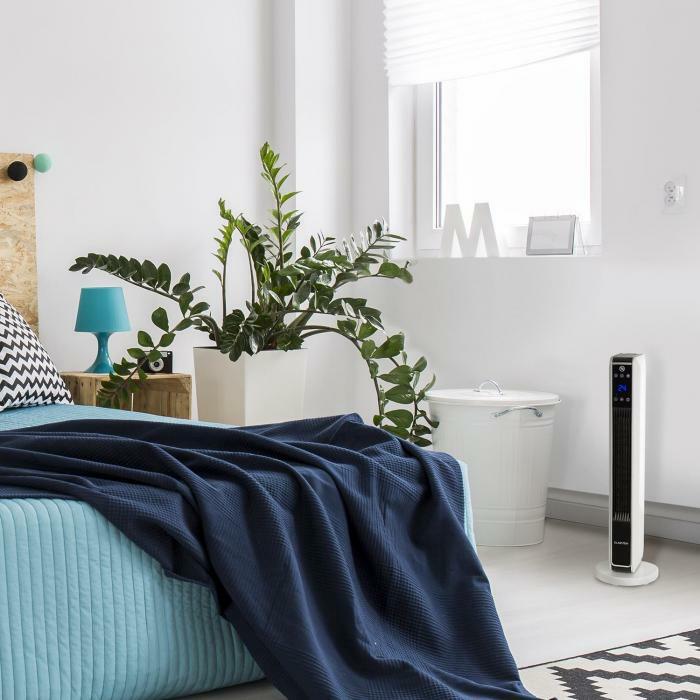 Cosy and fast heat without unpleasant odours: the Hightower Heat brings warm air into cooled offices, living rooms or garden sheds. Enjoy the warmth with the unbeatable advantages of a ceramic heating element: the device heats the air in lightning-quick speed, the heat can be felt just a few moments after switching on the heater. 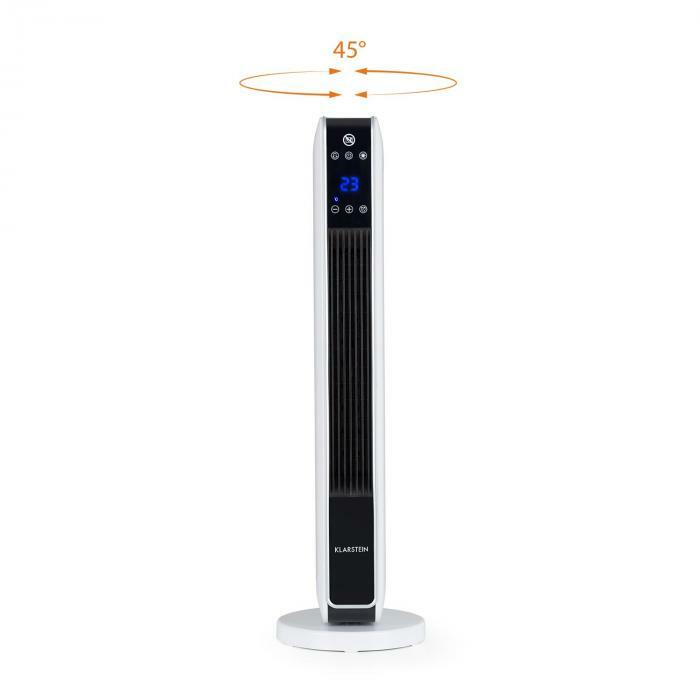 At the same time, the ceramic heating element’s small size fits perfectly into a space-saving column heater, such as the Hightower Heat. Despite high performance, it never gets so hot that dust particles burn. There are neither odours nor fine dust - so not only can allergy sufferers breathe easily. 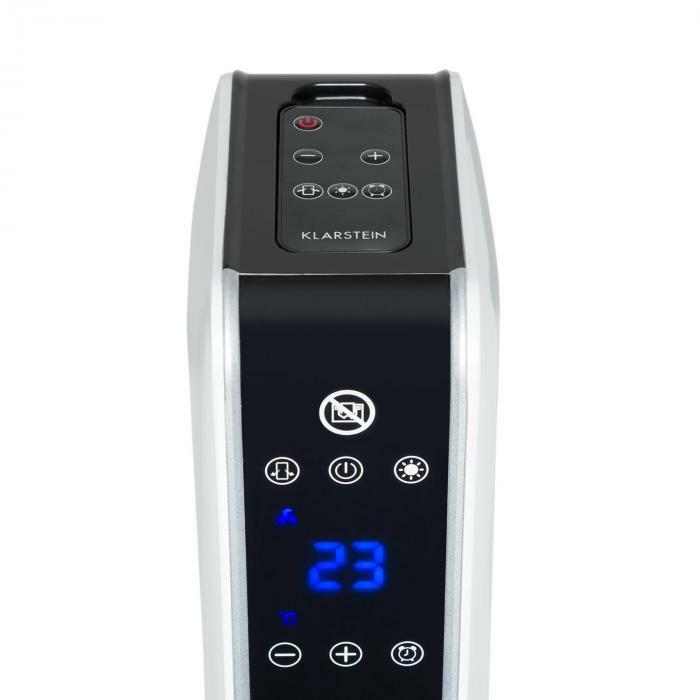 In addition, the air stream does not need to be cooled as much, which ensures a pleasantly quiet working noise. The higher weight gives the heater a firmer stance. 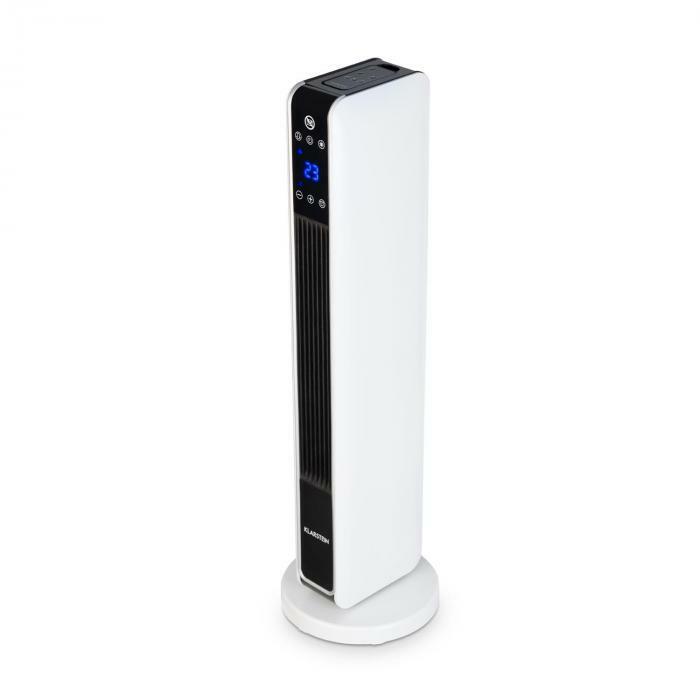 In addition to all these advantages, the Klarstein Hightower Heat ceramic fan heater also offers convincing performance: in two heating stages with 1200 watts or 2200 watts, it heats up rooms with a size of up to 20m². 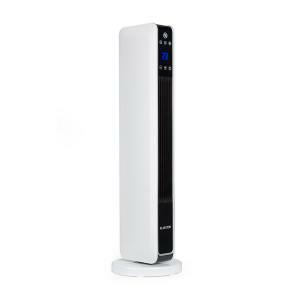 A switchable oscillating function distributes the warm air in the room and thereby accelerates the heating process. The desired target heat can be adjusted in degrees between 10 and 49 ° C. When it is reached, the heater switches itself off, but will immediately resume operation if the temperature falls below 3 ° C below the desired value - this saves electricity and keeps the room pleasantly warm. A shutdown timer is also available, which can be set in one-hour increments between 1 and 8 hours, which will switch off the device when the countdown runs out. 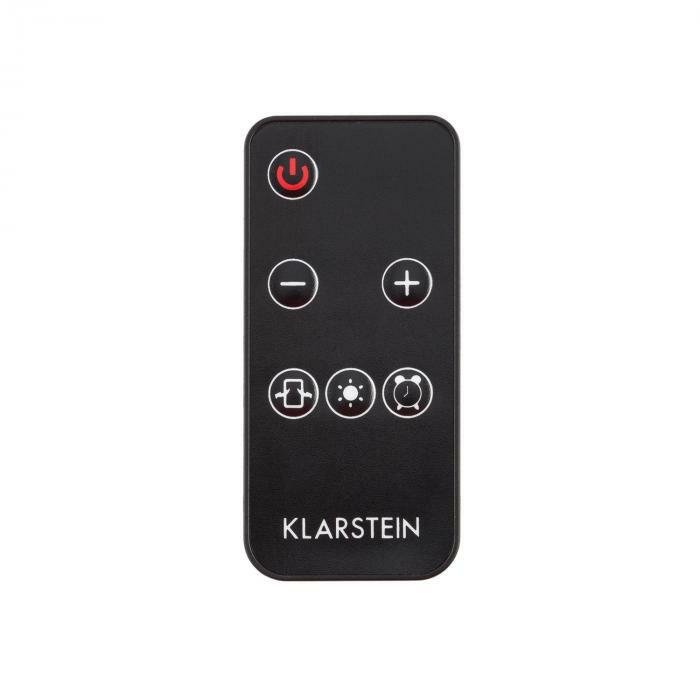 All functions are controlled via a clear touch panel or conveniently by remote control. The Hightower Heat is also visually appealing. The ceramic heating element conceals itself in a slender tower housing, which fits easily into every residential landscape with its straightforward white-black panel with silver accents. 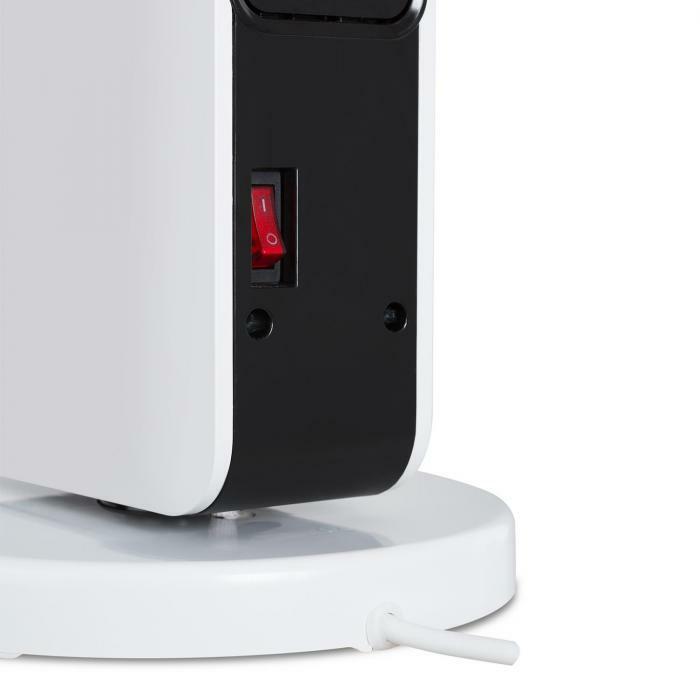 With its round base of 22 cm diameter, the Klarstein column heater is extremely stable and requires very little space.